Did you ever have a stamp that you were waiting for the right moment to use? This is that kind of stamp for me. It is an Stampin' Up! stamp called "Riot of Petals" and I saw immense possibility in it when I saw it. I have been waiting for the right moment to pull it out and play, and this is it! 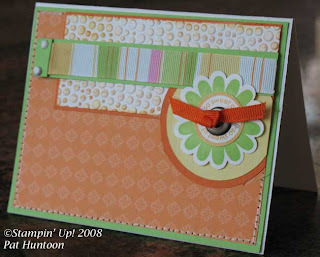 We were challenged to use the sympathy sketch on page 44 of the Stampin' Up! catalog for inspiration. My challenge card uses a small portion of the Riot of Petals image with a Cracked Glass effect (from the February 2008 issue of the Technique Junkie Newsletter) on the front panel. The panel across the center and the background both use the same stamp with matching ink/paper -- such a versatile stamp, don't you think? I colored the image with Copic markers, and used rub-ons for the words. Since the image is so big, I was able to make two full cards from it! The second card is on the right. I have to say, I am in love with how I was able to use the edge of the image as the background panel. I am going away for the weekend for total indulgence -- a scrapping weekend with eight of my BFFs. I can't wait to get together with my buddies, laugh and scrap. Hope your weekend is wonderful, too! I have been asked more times than I can count how I use unmounted rubber stamps. While there are many ways to use them, I have found a system that works for me that I am comfortable with. I am sharing my method here...if you have been hesitating about taking the plunge into the wonderful world of unmounted rubber, this tutorial is meant to help you get your feet wet! 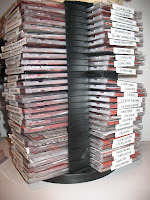 Empty, regular-sized CD cases (not slim-line, not double): I buy mine in Staples, Wal-Mart, Office Depot, Target, etc. I like Staples the best because they sell the biggest pack (25), and since I am constantly adding more stamps to my stash, more is definitely better. Good Rubber Cutting Scissors: I use Kai scissors. I think they cut rubber better than any other I own. I am also particular about this -- my Kai scissors ONLY cut rubber. God forbid one of my children pick them up for ANY reason! Glue Stick: Any kind will do. Acrylic Blocks: This is an investment that you make ONCE. I own a bunch of these in various sizes; My suggestion is to get 4 to start: a big one for background stamps; a medium/large one (3-12" square is a nice size) for medium images; a little one (think 2" square) and a long thin one for alphabets. You can always add to your collection as you think you need them, based on the images you are stamping. Stamp Cleaner or Water & a Scrubbie or Paper Towel: This method has unbelievably good and easy clean-up. Good for those of us who hate to clean anything! Label Maker or Regular Labels: Easier to keep track of what you have if you label it, right? 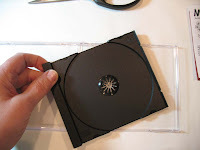 To start, remove the black CD Tray insert from the CD case. Just kind of wiggle it out to remove it. I haven't found a use for these, so I throw them out. If anyone has any ideas on what to do with them, let me know! I hate to waste things. 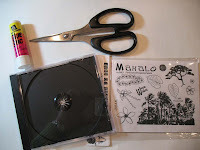 Use the rubber cutting scissors to cut out the images carefully. Do not "undercut" the images; a little around the edges stabilizes them and will not leave a shadow of ink when you stamp. Be conservative -- you can ALWAYS cut more off if need be. 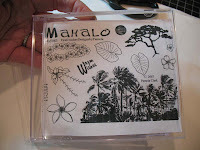 If the stamps came with one, cut the Index Print to a size that fits into the top of the CD case. If you are double stacking the stamps, the index print will be too large, too, so simply cut it in two and put one on the top and one on the bottom. 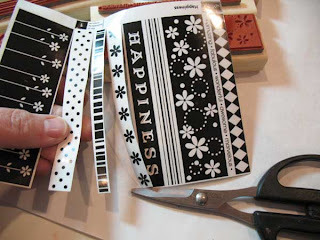 This step important -- you will be more likely to use the stamps because you can see the images in Black and White. It the stamps did not come with an index print, you have a few choices: You can print the set image off of the stamp company's website (I do this ALOT), or you can stamp an index print yourself! Here is the shamefully easy part. Before stamping, condition the stamp. Directions for doing that are HERE in case you missed that post. Here is the best part!!! Just ink the stamp and stamp image where you want it. This is one major advantage over wood -- you can see exactly where you are stamping. 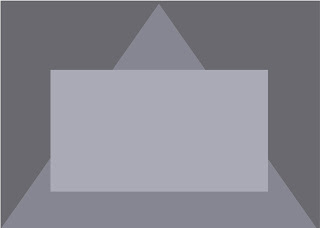 For large images, use a mouse pad under the paper so that you can press evenly with a bit more cushioning. If you are a scrapbooker, you will LOVE using unmounted Alphabet stamps. You can line up several letters at once and actually see where they are going. Just remember to line up the letters backwards -- start the first letter on the right side of the block, then the next letter on it's left, etc. I also like to stamp the word on scrap paper first to check placement of the letters (I invariably put the b,d,p's backwards). The beauty of using a glue stick is that you can move the letters a nudge if need be to adjust spacing and alignment. Once you use unmounted alphabets, you will have a hard time going back to the wooden ones! Now for the fun part. To clean the image side of the stamp, simply spritz with stamp cleaner and rub over your scrubber (or do whatever you normally do). 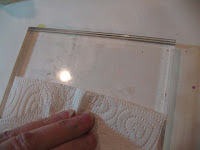 To remove the rubber from the acrylic block, simply peel the rubber off, spray both the rubber and the acrylic with stamp cleaner OR water, and wipe off with a paper towel. That's it! Sparking clear acrylic again, and stamps that look like new! Okay, that's about it...I hope I have helped someone! If you have questions, leave me a comment about it (you can comment if this was helpful to you, too, that is always nice to know) and I will answer your questions when I can. Ah....summer breezes...warm beaches...the smell of flowers. That is what I am bringing you with this giveaway! Today's lucky winner will receive a little bit of paradise in their mailbox. 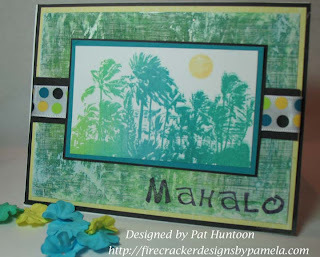 The stamp set shown at right from Firecracker Designs by Pamela will float on a warm tropical breeze to the lucky winner with the card above. The card itself uses the images from an identical stamp sheet, and features the Oil Pastel Gesso Technique from the February 2008 issue of the Technique Junkie Newsletter. 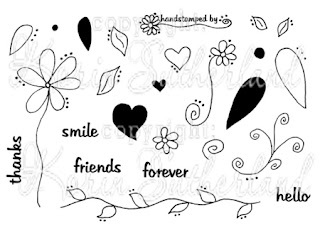 Firecracker Designs by Pamela offers a nice variety of deeply etched unmounted rubber stamps. I am pleased to let you know that Pamela is releasing 9 new sets March 1st!! Pamela is also doing a random drawing for 5 winners drawn from her blog comments, also -- each winner will receive one of the new 4x5 sets. So listen up -- now you have 6 chances to win! Make sure to enter here, and on Pamela's blog, too. 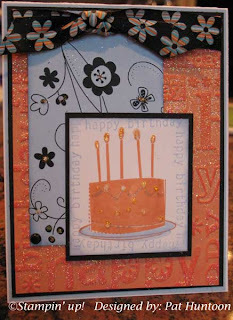 Check out her cool die cuts too -- they match her stamps! 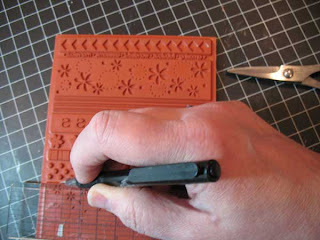 Not sure how to use Unmounted rubber stamps? Come back tomorrow -- I have a tutorial for you on what I do. Now, here are the details for the giveaway (notice that the sign up time is a little longer -- I am going away for a scrapbooking weekend, so I will announce the winner Sunday evening). ANYONE can enter this give away. One entry per person, per give away, please. To enter the give away for today, simply leave a comment on this blog entry telling me that you would like to enter by 11:59pm EST on Saturday, March 1st. No other entry methods will be included in the give away. If you email me to enter, your entry will NOT be considered a valid entry. When you leave the comment, make sure to put your NAME in the comment -- if you enter your comment as "Anonymous", I cannot give you the prize! Blogger does NOT record your email address for me, so you will need to check back to find out if you have won or include your email address in your comment so that I can notify you. A good way to do this is like so: phuntoon at optonline dot net -- it will help protect your privacy! I will have a random number generator pick one number from the comments to select one winner. Each give-away is separate, so to be eligible for a specific item you must enter that day's contest on the post where it is listed. Enter today -- good luck! I have blog give aways every week -- come play! Congratulations to Faith Epp for winning this set! Sometimes you have to just do some things twice to get them right. This was one of those times. These two cards are my submissions for Mary Jo Price William's Technostamper Sketch Challenge #6. 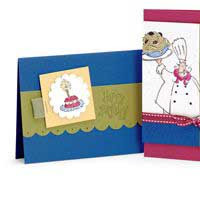 The card on the right uses ribbon, designer paper, and one of the scallops from Stampin' Up! 's So Many Scallops set. The White strip is Cuttlebugged, with a swipe of pumpkin pie. The edges of the Orange Designer Series Paper use the Faux Stitching Technique from the April 2006 edition of the Technique Junkie Newsletter. I do like the big grommet in the center of the scallop, but the rest of it seems so "blah" to me...so I made the card below with the sketch, too. 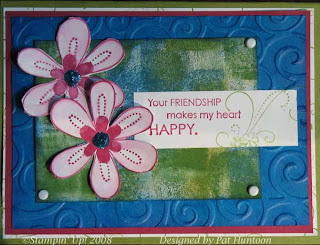 The card on the left uses a Butterfly stamp from Starving Artistamps, layered over a Veined Marble background (Technique Junkies August 2007 issue). 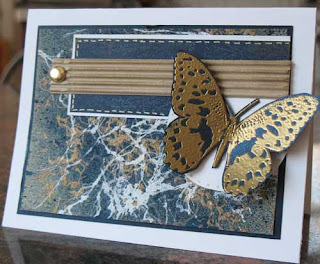 I actually like this card better -- I love the gold accents and I really just love the butterfly, too. I added a piece of corrugated paper and a big bold brad to spice up the denim look on the blue strip -- and did a little faux stitching here, too. Although I like this card much better, I still don't think I nailed it. I can't wait to see what the other players do -- check out Mary Jo's blog to see them all! These are the Weekly Technostamper Sketch Challenge #5 cards from the Technique Junkie subscribers. A new challenge will be posted tomorrow! 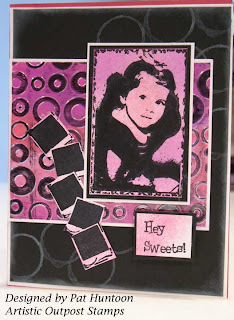 Julie has won this week's giveaway -- the Sweet 'n Sassy Stamp set from Wednesday's giveaway. The Sweet 'n Sassy Sale is still on, though, so go check out Korin's site! I just love these giveaways, don't you? Today I am proud to be giving away stamps from Sweet 'n Sassy Stamps. Korin Sutherland has designed these fun stamps, and I am thrilled to be able to give them away to you! 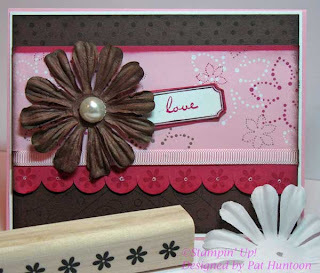 The card above features Sweet 'n Sassy Stamps on the front panel; the panel on the left of the card uses the Dry Embossed Wash Technique from the December 2007 issue of the Technique Junkie Newsletter. The lucky winner of today's giveaway will receive the stamp set on the right, plus the card above. 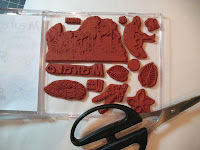 These are acrylic stamps which Korin send in their own acrylic CD-style case. Also, if you are a Technique Junkie, Korin has a special offer for you! Sweet 'n Sassy Stamps 3-day TJ ONLY Sale -- Being a member has it's perks! TJ members only will save 15% off our already low prices now through Saturday, February 23rd. To take advantage of this sale you MUST email your order to korinstamps@comcast.net and use TJ Sale in the subject line. This sale is good for EVERYTHING in the store! Okay, want to know how you can be the lucky give away winner? ANYONE can enter this give away. One entry per person, per give away, please. To enter the give away for today, simply leave a comment on this blog entry telling me that you would like to enter by 11:59pm EST on Friday February 22nd. No other entry methods will be included in the give away. If you email me to enter, your entry will NOT be considered a valid entry. When you leave the comment, make sure to put your NAME in the comment -- if you enter your comment as "Anonymous", I cannot give you the prize! Blogger does NOT record your email address for me, so you will need to check back to find out if you have won or include your email address in your comment so that I can notify you. A good way to do this is like so: phuntoon at optonline dot net -- it will help protect your privacy! I will have a random number generator pick one number from the comments to select one winner. Each give-away is separate, so to be eligible for a specific item you must enter that day's contest on the post where it is listed. Enter today -- good luck! I have blog give aways every week -- come play! I mounted this balloon stamp today to make this card for my son's birthday and it got me thinking. The difference between excellence and mediocrity with stamped artwork begins the minute the ink hits the paper. You can have an excellent design that no-one will ever notice if the images on the paper are not clear and fully inked. It is one of my pet peeves to see splotchy images because I know that it can be avoided easily. After the rubber stamp manufacturing process, a thin layer of residue remains on the rubber that needs to be removed before using your stamps. This is especially important with bold or solid images. 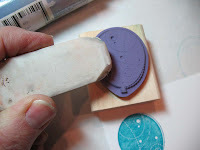 Below are several ways to condition your stamps before you use them to help the ink to grasp the rubber and transfer to the paper in the best possible way. These represent the various ways that I use personally to condition my stamps. Personally, I think this works the best. The solvent in the StazOn cleaner is strong enough to remove the film on the stamp. I like to douse my stamp with the solvent, rub it several times on my stamp scrubber, then clean it again with my regular stamp cleaner. I use this method frequently. 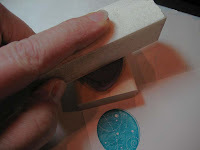 Gently sand the stamp with a sanding block in one direction, then 90 degrees in the other direction. Then clean with stamp cleaner. This method tends to freak people out, but honestly, a gentle sanding does NOT hurt your stamp. 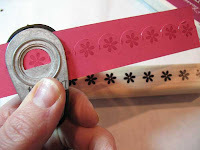 This was the way I originally learned how to condition my stamps. 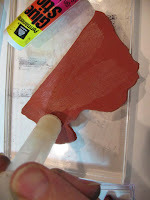 This is a great solution for removing the film, but it takes some elbow grease! Rub your eraser all over your stamp, then clean with a stamp cleaner and scrubber. After conditioning, test the stamp by inking and stamping again. If the image looks blotchy, condition the stamp again before using. One additional note -- It is critical that good paper is used for bold stamps. Cheap paper will look blotchy no matter what! I hope these tip help YOU get better images! 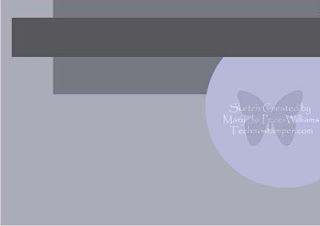 This is my challenge card for Mary Jo Price William's Technostamper Sketch Challenge #5. 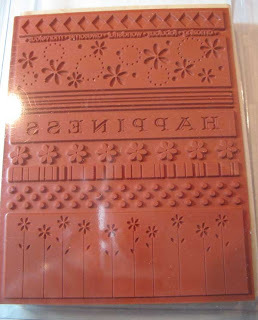 When I first saw the sketch, I just knew I wanted to incorporate rub-ons -- and the long rub-on from Stampin' Up! 's Sale-a-bration packet seemed like a perfect match. First, I stamped the background in the design I wanted, making sure to decorate a much larger area than I actually needed for the border. Then I carefully cut out the rub-on border WITH the non-stick background. 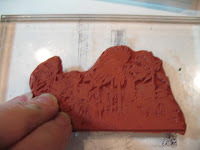 When placing the border and rubbing it on, I left a 1/8" border of paper along the widest part of the rub-on to ensure that the entire rub-on piece would have paper behind it. Better to cut it off then not have enough! To finish the border, I used scissors to cut carefully along the edges, then adhered it to the second piece of cardstock and cut off the excess. Here is the original sketch if you would like to play along -- Note that the butterfly is NOT part of the sketch! Check out Mary Jo's blog to see the other sketch players and their versions of the sketch. It always astounds me to see so many variations! 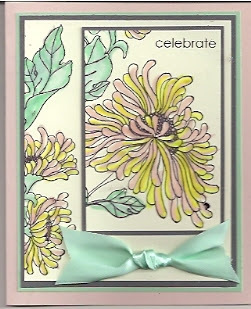 Sale-s-Bration Rub-Ons, Enjoy Stamp Set, Sanded Background, Barely Banana Ink and Paper, Pretty in Pink Ink and Paper, Chocolate Chip paper, Crystal Flowers from unknown source. These cards are from the Technique Junkies as they play along with Technostamper's sketch 4 from earlier this week. Enjoy! The winner of the Artistic Outpost Give Away is....Vicki Hawhee! Congratulations Vicki! Your stamps, the card and the Shimmer Sheetz will be mailed on Tuesday. 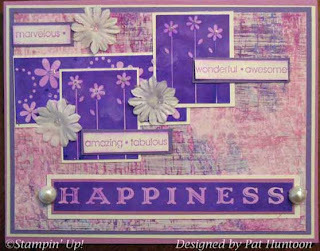 Today's Blogger's challenge was to use the layout on Page 42 of the Stampin' Up! idea book (the HB card) for inspiration. The layout is rather, well, simple, so that left quite a bit for interpretation. My creation uses several of the stamps from the new 9 block Happiness set (formerly one block, see the post below about The Block Guy) . I was thrilled to find out that the flowers from the Happiness set make a perfect scalloped border when using the round slit punch (shown right). That made me feel even better about breaking up that Happiness block! The layout for the challenge is below the card ingredients. Make sure to check out the other Blogger's Challenge cards -- the list of players is on my sidebar. Don't forget to enter the GiveAway for the Artistic Outpost stamps, either! You have until Midnight tonight to enter (Friday, Feb 15th). The details are two posts below this one. I had been eyeing this stamp for a long time. I knew I wanted to split it up, though, because a stamp like that -- with so much solid space -- is almost impossible to ink properly. I am a big proponent of proper stamp conditioning to get stamps to hold ink and stamp the right way. It is a peeve of mine when there is white where there should be color. Especially on my OWN work. In order for me to use the stamp unmounted, I would have to peel off the mounting cushion, and I hate doing that. I also know that unmounted straight-line stamps are very hard to use. So what to do? 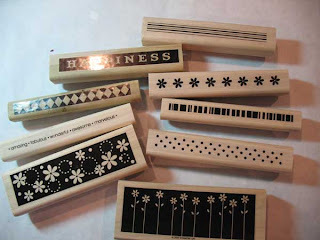 One day I visited Patty Bennett's blog and she mentioned that she had a resource for wood blocks for this set. I was all over that like butter on toast! So I went to the blog of Mitch Kemp: The Block Guy -- and ordered my own set. I mounted them today and viola! A perfectly inked, perfectly straight stamp! And guess what ladies! He has them on sale now, too. I am not affilitiated in ANY way -- just thrilled with his service. If you have been thinking about doing this at all, I encourage you to email him! When the set of 9 blocks came in the mail (very fast service! ), I immediately went to seperate the stamps. Because some of the images are close to each other, I used a ruler and craft knife first to create guide lines before I used my Kai scissors to cut the rubber. When done, I carefully used scissors to cut apart the index and adhered them to the blocks (very smooth -- very professional). Now I have a set of NINE (9) stamps that I will use 9 times as much as the one big honkin' stamp! The cool thing is that The Block Guy has wood for other sets too -- my next one to mount is the Lots of Thoughts set. If you order, tell Mitch I sent you! A few days ago I posted about the Glittery Cuttlebug Technique and couldn't remember where I saw it. I am happy to let you know that the techniques came from Sarah Bevard's delicious blog Craftaholics Anonymous. Thank you for the inspiration, Sarah! Our techniques are just slightly different -- hers is easier than mine, so try them both out! I am so pleased with the give away today! Our sponsor today is Artistic Outpost -- and the lucky winner will receive the Polaroid Cutie sheet that this card was made from. In addition to that, I will mail the winner one of the pink Shimmer Sheetz that this was made from, along with the card itself. The technique used on this card was Aged Metal from the February 2008 issue of the Technique Junkie Newsletter. Something about the vintage feel of these stamps just SCREAMED Aged Metal. ANYONE can enter this give away. One entry per person, per give away, please. To enter the give away for today, simply leave a comment on this blog entry telling me that you would like to enter by 11:59pm EST on Friday February 15th. No other entry methods will be included in the give away. If you email me to enter, your entry will NOT be considered a valid entry. When you leave the comment, make sure to put your NAME in the comment -- if you enter your comment as "Anonymous", I cannot give you the prize! Blogger does NOT record your email address for me, so you will need to check back to find out if you have won or include your email address in your comment so that I can notify you. A good way to do this is like so: phuntoon at optonline dot net -- it will help protect your privacy! I will have a random number generator pick one number from the comments to select one winner. Each give-away is separate, so to be eligible for a specific item you must enter that day's contest on the post where it is listed. Enter today -- good luck!I have blog give aways every week -- come play! Glittery Cuttlebug - a little "How-To"
I joined a challenge on an SU-based egroup this week for cards that glitter. I drew Leigh's name (no pressure there!). 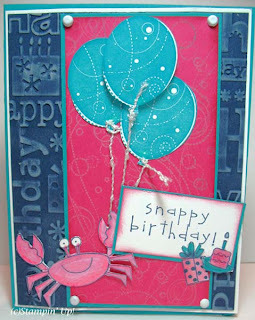 This idea -- Glittered Cuttlebug -- was something I found on Sarah Bevard's blog (Craftaholics Anonymous) this morning. I thought it would be great for Leigh's card. I also know that Leigh loves ribbon, so I built the card's colors around it. 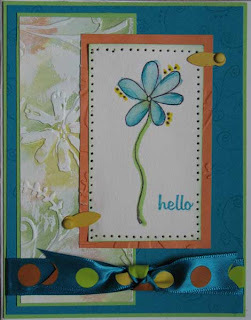 Run cardstock and embossing folder through the Cuttlebug. 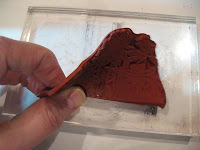 Gently rub Pigment Ink over raised areas. Dump on Stamp and Stick Powder and Remove Excess. Heat according to manufacturer instructions (usually until it just gets shiny). Pour on the Glitter; remove excess. Try this card and let me see what you do! Leave a link in the comments or simply email me a .jpeg image (TJ members, you can put them on the group) and I will put them up here! These are the Technique Junkies versions of the Technostamper Challenge #3 - Enjoy! Sometimes life is just "bradilicious." Or at least, that is what I am telling myself! This is my version of the Technostamper Sketch Challenge #4. I used the Magic Pattern Technique for the focal point image. Magic Pattern is featured in the February 2008 issue of the Technique Junkie Newsletter. I wish my photo showed the texture on the image in more detail -- you will have a better view if you click on the image to make it larger. Let me tell you, it took a considerable amount of Jockeying to get the Cuttlebugged edges on the long side of the card!!!! Of course, I can't leave well enough alone, so I turned the layout and used it on a long card. I like it this way...do you? Now, if you will excuse me, I have to go shopping for more brushed silver brads! Did you ever have a picture that you cherished? I did, with this 5” x 7” picture of my son in the upper left corner of layout. It took me a while to finally get to these pictures since I loved that picture so much, but I am happy with how it turned out! (If you would like to see the details on the layout, click on the picture). 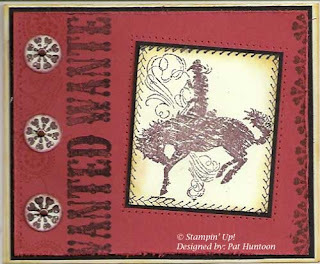 The title on the layout was printed in word, printed out, then stamped with images from Stampin’ Up (Bronc Buster & Wanted) and a stitch stamp from Just for Fun. I also inked the edges. I repeated this on the labels for each photo and on the stamped elements, too. I had one extra element that was too big for the layout, so I make an oversized card out of it, below. The paper on the layout is Bohemia Paper from My Mind’s Eye (my favorite line of paper, ever), as is the frame in the right corner. The paper, stamps and ink on the card are from SU. Thanks for looking -- have a creative weekend! LOOK at what the Technique Junkies did!